The Sony Xperia T3 packs a 5.3″ IPS display of 720p resolution and is powered by the popular mid-range Snapdragon 400 chipset. Sony has provided the Xperia T3 with an 8MP ExmorRS camera sensor and the phone comes with the Android 4.4.2 KitKat OS out of the box. The Xperia T3 has an impressively slim waistline at 7mm, but typically for Sony the screen bezels aren’t as impressive. The non-removable rear cover is made of matte plastic, unlike the Xperia M2 and its glossy treatment. 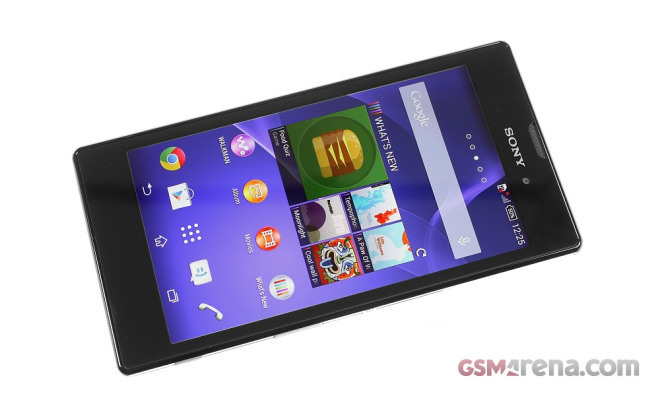 Sony Xperia T3 coupled with Android KitKat looks snappy enough and should handle the everyday task hassle-free. Enough small talk, here comes our unboxing hands-on and the traditional short UI tour. You bet we are already working on the Sony Xperia T3 proper review and it should go live in the beginning of next week. Stay tuned!